Today’s a good day to freshen up that travel companion laptop. 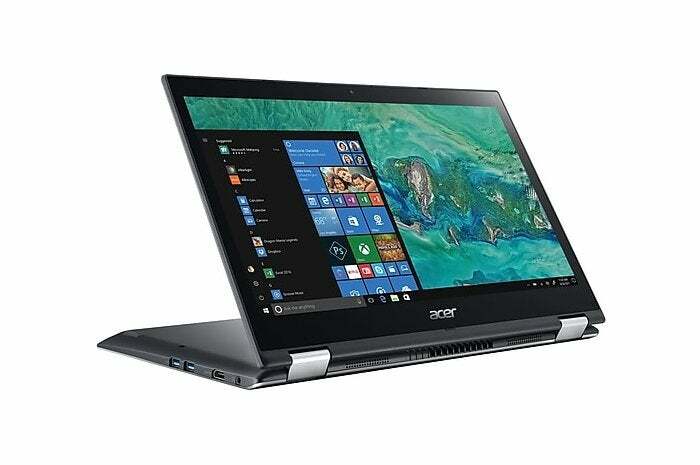 Staples is selling the Acer Spin 3 2-in-1 for $460Remove non-product link. The list price for this convertible is $650 on Staples’ site, and you can find an underpowered version on Amazon for $484. The Staples laptop comes with a dual-core Intel Core i3-8130U processor, 8GB of RAM, and a 256GB SSD, which should make it a speedy and responsive modern system. The version on Amazon, by comparison, has just 4GB of RAM and a 1TB spinning hard drive, making it noticeably slower than the Staples model. The Spin 3 also comes with a 14-inch 1080p multi-touch display, two USB 3.0 ports and one USB 2.0, one HDMI, and 802.11ac dual-band Wi-Fi. The best part of this laptop, however, is that the display can rotate 360-degrees for use as a tablet, regular notebook, or the infamous “tent” mode for watching videos. If you don’t need a spinning lid and prefer storage space over storage speed, then Newegg’s got an Acer Aspire 3 for just $375Remove non-product link. This laptop has a more powerful 2.5GHz Intel Core i5-7200U, 6GB of RAM, and a 1 TB hard drive, but watch out for the low 1366x768 display resolution. For more options, be sure to check out our best laptop recommendations.